Lydes was a lovely place to grow up. Green and beautiful, bustling in its own way, and not too far from the heart of the Empire. Ancestral homes have a certain way of living in someone's very blood, no matter how far they roam, and the Chateau de Lydes would do precisely that to Marie. The second child of the Duke de Lydes, led only by her brother Remache, there had been much celebration of her birth. Marie Aurore de Lydes, a first daughter, bright eyed and adored. From a young age she was a well spoken and polite child, taken to following along at her mother's skirts, or sitting in her father's office, listening in on their politics. In a world where her older brother was less adept, she might have been named her father's heir. This was not the case, however, with her brother being quite on the same level as his sister. When Marie was six, possibly the most interesting guest yet stopped at the Chateau. A Grey Warden, separated from his unit and needing a place to spend the cold night. Her mother had opened the doors to him, with the Duke in Val Royeaux for a few weeks, taking Remache with him to introduce him to the Court. Marie had been so curious, and her mother had been seemingly enthralled. What was meant to be one night turned into two, with the excuse of needing to resupply. And then the Warden was gone, and Marie was too young to understand why her mother's steps were a little lighter, or why she spent so much more time writing letters. Her father returned only a few days later. And later that same year, Marie's younger brother Jean-Gaspard was born. This would be a series of events that Marie would wonder over when she had a few more years under her belt, and one that she would dismiss as not worth questioning when she had a few more years of wisdom on top of that. When Marie was ten, she was taken for the first time to Val Royeaux. Dressed as fine as she had ever been, her first mask given to her by her mother, she felt as though this was precisely where she belonged. The dancing, the lights, the clothes and masks, and Marie found that her years of listening at her mother's side had served her well. She could follow three conversations at a time, while holding one herself. And at that young age, people noticed her less. That first trip to Val Royeaux laid a bedrock of rumors and secrets that would be the start of a prized collection. And she grew into herself, she would trade whispers like they were gold. It came like breath to her, the turns of the Game, keeping a step ahead, making sure there was always at least a window to get out of. By sixteen she had a reputation in Florian's Court. But Florian's Court was, frankly, a mess. Emperor Florian had no interest in governing, or being a proper Emperor in most respects. By the time Marie was twenty, she had grown bored of sharpening her claws on her countrymen. So when Florian died, Marie, and many others, didn't look to hard. When Celene took the throne, plenty of people whispered. And Marie collected those whispers like precious gems. Crafted them into fine jewellery, and presented them to the young Empress with the gentle smile of a woman who knew what it was to be able to play the Game from a young age. She curried favor where she needed to, softened her father to the idea of a young Empress, and earned herself a position as an official diplomat for Orlais. It let her see the world, and it allowed her an excuse for not taking a husband. It wasn't that Marie was opposed to marriage, mind, simply that she knew her worth, and wanted to play that chip only when it suited her. So out she went, to be a bastion of Orlesian civilization wherever she was sent. First, it was Cumberland, and there she grew quite comfortable. Trading stories and secrets, making connections and relations, throwing a monthly salon that became quite a social event of the city. She took on proteges, and taught them what she could in the seven years she was there. She made friends, but it was not home. For her accomplishment, her mother sent her the gift of a white lionette cub on her 29th birthday, a reminder of where she belonged. When her father grew ill, she returned to Orlais until he passed, always feeling a call to her family and their home above all other things. And when her brother took over the duchy, she saw that he was settled. Helped him establish influence where he could get it, saw that their extended family remember where they had come from. 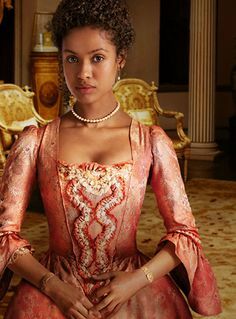 The two of them together were a force to be reckoned with, and by the time Marie returned to the Empress to request a new assignment as a diplomat, her brother's position as Duke was a well entrenched one. Kirkwall was Marie's next assignment. There have been whispers floating from the city since the last Viscount was unseated. The Empire wanted eyes there. The Empire wanted someone to whom her people could turn if they needed while they were in the city on business. So to Kirkwall she goes, to build anew what she had in Cumberland, or perhaps something different. Now the sister of a Duke, rather than a Duke's daughter, and her lionette cub fully grown into all her glory, her next project would surely be something new. Kirkwall might be a mess, but Marie's never been one to shy away from fixing a problem when she needs to. Marie holds monthly salons in Kirkwall. Most people can get an invitation, as they are also something of an open house for the ambassador.